This is important :) ......So please vote! Well chocolate, of course ;) Why bother asking? That's a hard one...either is great and the time of day doesn't really affect my decision as my mood at the time would. But your right, if it were 8 in the morning instead, I would choose the blueberry muffin hands down. The blueberry ones are my favorite! So yummy! My kids all vote for the chocolate one with sprinkles...go figure! I love your site and enjoy reading it. 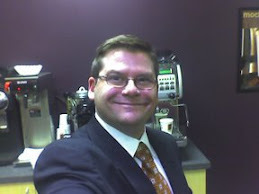 I feel I have an allegiance to Biggby, as my husband's cousin is Jim McFall. We enjoyed seeing his picture on here! Oops...I didn't realize I was logged in as "google"...sorry! CUPCAKES!!! All day, any time, hands down I'm for cupcakes! I'm ready for chocolate anytime after 10 am. If you had said 8 am, then I'd have gone for the blueberry muffin. I love chocolate, but somehow a blueberrry muffin sounded really good to go with a cup of coffee. Muffin. It goes great with tea in the afternoon. Amy...the Mcfall's are an awesome clan, and there couldn't be a better President for this company than Mike McFall! Blueberry muffin...is of course the number one muffin.....but it looks like the Choc/Choc cupcake won! Oops, I meant Mike McFall, not Jim! 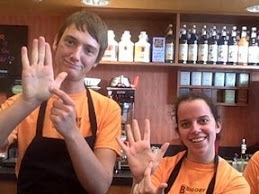 President of BIGGBY COFFEE Recognized! Escanaba -- getting there, eh?